When I saw the news on my Chicago Tribune homepage last night that Joyce Brothers had died, my heart sank. I never met her, never had an exchange with her, and yet she helped me a great deal. She showed me the way, and she helped me sort out my head at a time when I was struggling. If I am ever asked what the five most important books of my life are, her book The Successful Woman would be on that list. One day in 1990, when I had finished graduate school and was searching for my first job in the U.S., I was wandering about the Chicago Public Library’s main building downtown, utterly stressed out and distraught about how I would manage to have a career and a family. And there, on one of the display shelves, I spotted the title The Successful Woman – How you can have a career, a husband and a family – and not feel guilty about it, published in 1988. It was just want I needed. In The Successful Woman, Joyce Brothers shares how she and many other prominent women managed to be happily married, have a child, and a high-flying career. It presents many lessons learned, practical advice, psychological insights, trade offs and regrets – her main regret? That she felt having a career meant she could only have one child. At the time I happened upon Joyce Brothers’ book, I was still fairly new to the U.S. All my friends were fellow graduate students; I didn’t yet have older friends to advise me like I have now. 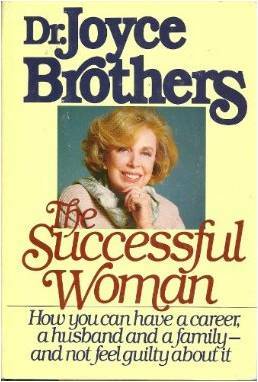 So Joyce Brothers, in her practical way, became my role model. This book, with its many examples of successful dual-career marriages, became a road map. One example of a lesson I picked up from her: marital trade offs. When you go on a trip by yourself (be it business or pleasure), and your husband minds the home front, then you owe him one. And vice versa. One of her other marital insights (I’m not sure if it’s from this book or another): Marriage is the salt of daily life – if it’s right, it makes everything so much better, but if it’s not (i.e. too much or too little), it spoils it. Thankfully, it’s been right for me. My husband and I are going to have our 25th wedding anniversary in June. So thank you, Joyce Brothers. You showed me my life was possible when I doubted it the most. Annette, thank you for your tribute to Dr. Joyce Brothers. My husband and I will have our 41st wedding anniversary in June. Congratulations on your forthcoming 25th anniversary in June. Barbara – thank you, and congrats on 41 years of marriage! What an achievement! A wonderful tribute to her, Annette.